At the end of the days of Lenten fasting comes a time of sweetness. Spring is in the air, flowers are blooming, strawberries are rampant. It’s time to celebrate with a lovely cake such as bizcocho de huevos—egg-rich sponge cake. 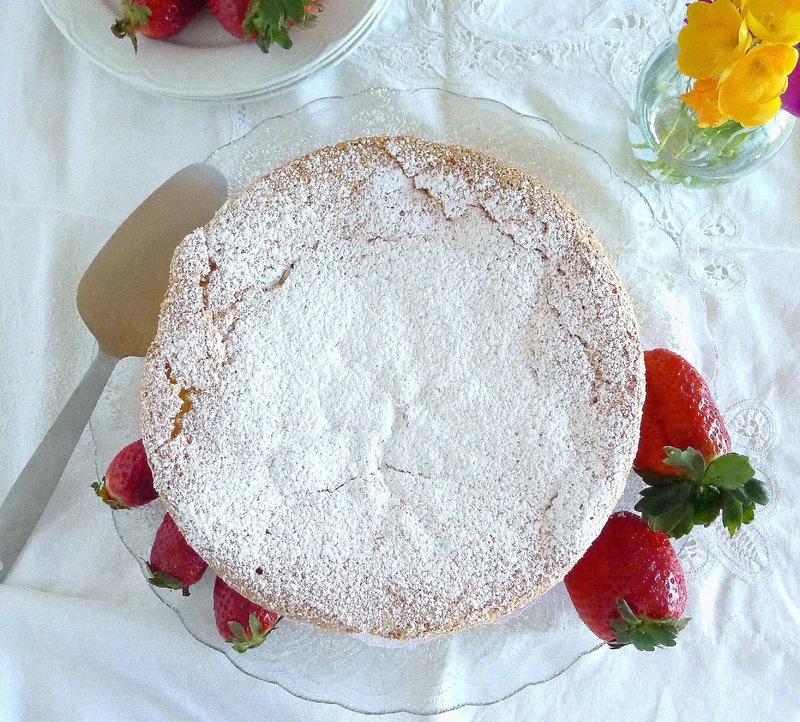 Sweet sponge cake with fresh strawberries. 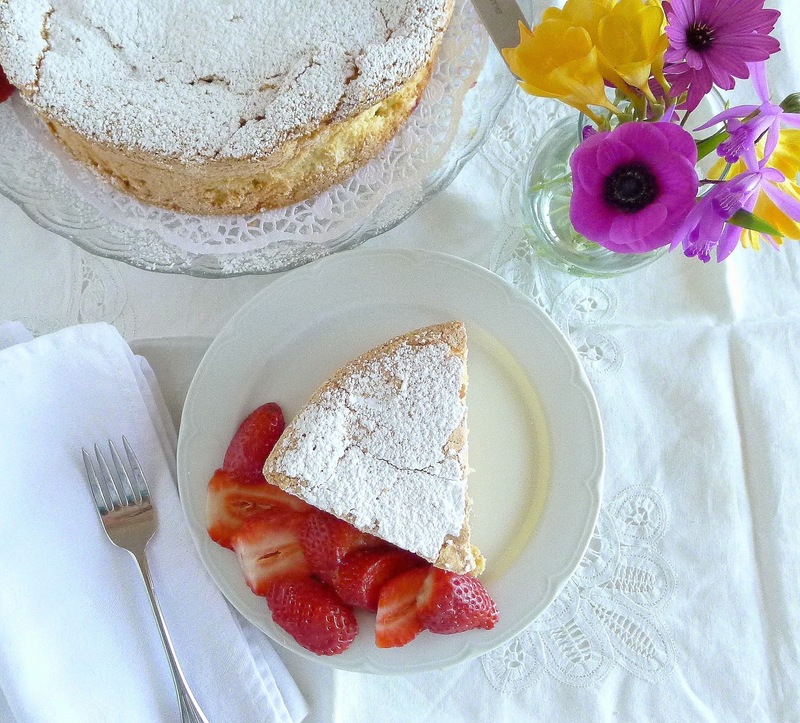 “Bizcocho, hecho con huevos,”--sponge cake, made with eggs--said a dear friend, as she presented me with a gift of heavenly sweet sponge cake. 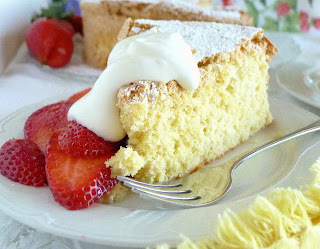 Indeed, her bizcocho was made with freshly-laid eggs from the hens she kept on the back patio. In those days, she carried her eggs to a nearby tienda, a tiny food shop, weighed them, and purchased the same weight of sugar (minus a tablespoon for the shells) and half their weight of flour. A very simple recipe. The same recipe appears in Sephardic (Spanish Jewish) cookbooks, where it is called pan de España, or “Spanish cake”. Sponge cake with strawberries and whipped cream. 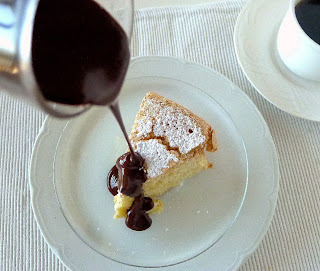 Sponge cake with chocolate sauce. 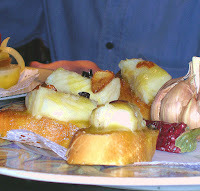 Plain bizcocho appears on breakfast buffets in fine hotels. 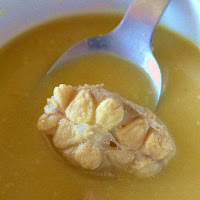 It’s served as merienda, afternoon “tea,” with hot chocolate, coffee or tea. 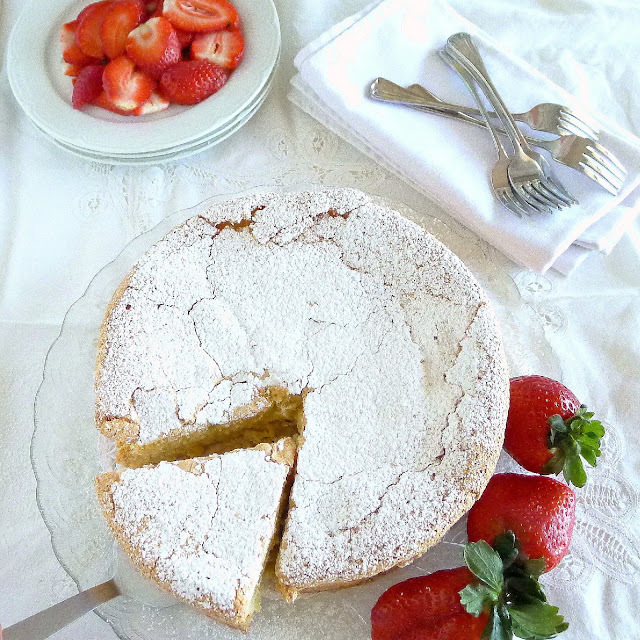 Split and filled with fruit jam or pastry cream, the cake becomes an elegant dessert. 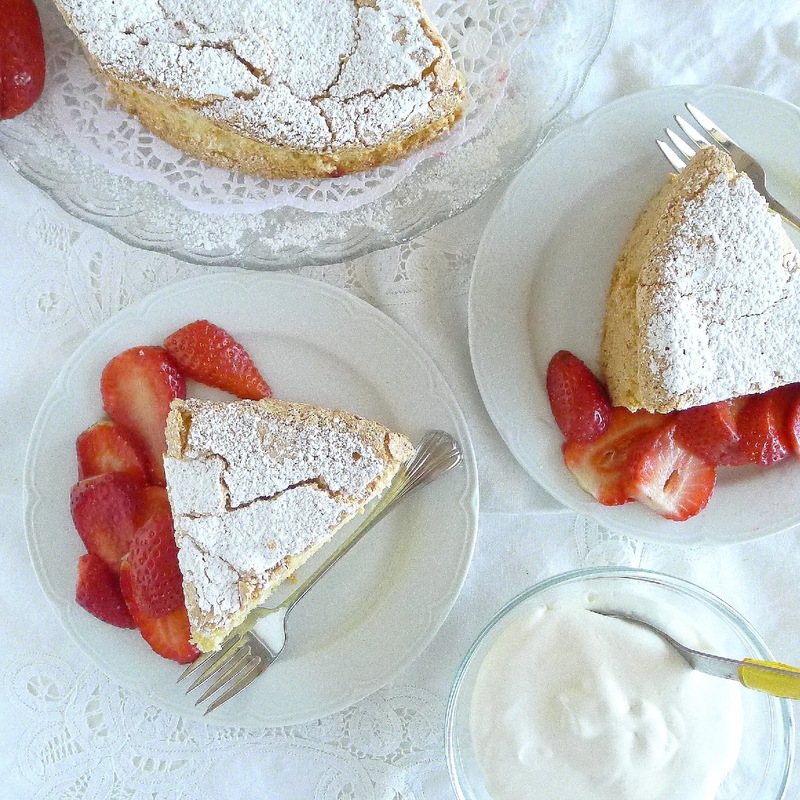 It makes a fine base for fresh fruits, topped with whipped cream, if desired. Fresones--giant strawberries--from Huelva (Andalusia) are as delicious as they look. 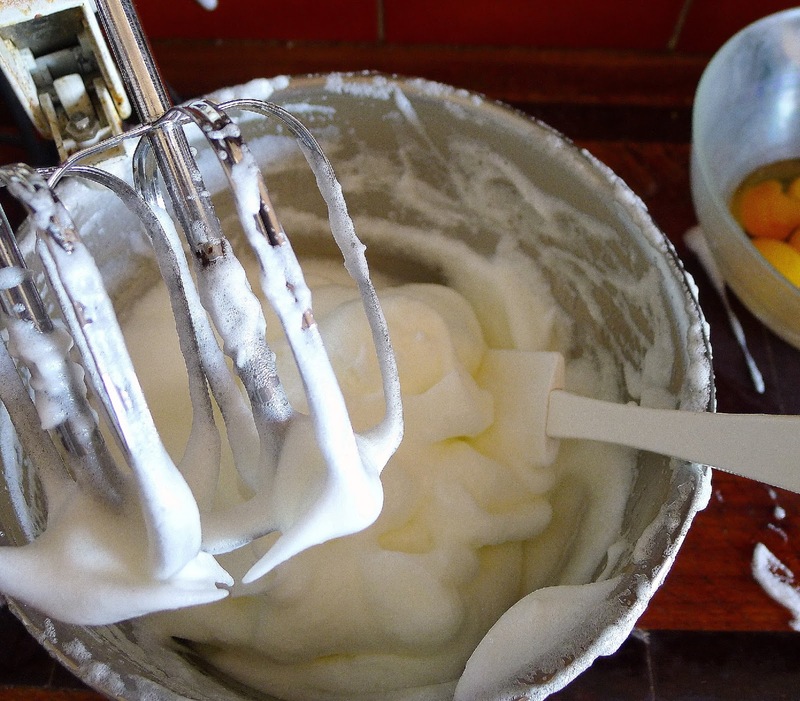 Add a bowl of whipped cream. Today bakeries make bizcocho with fewer eggs and added shortening. Many recipes call for baking powder. 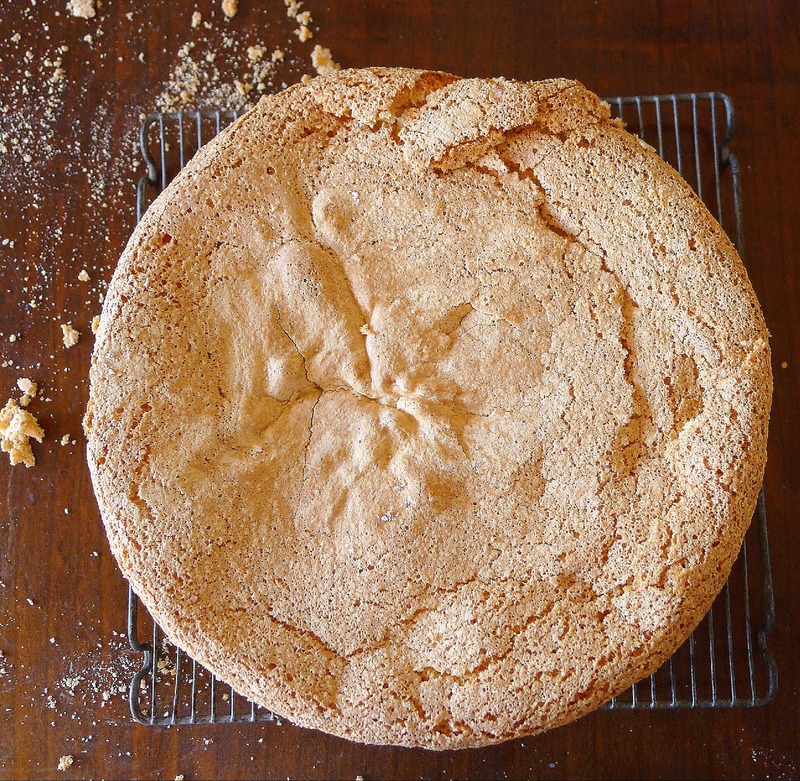 But here is the original sponge cake, as I learned to make it and as village women still make it. Eight large eggs weigh just about exactly 500 grams. Half the weight of flour is 250 grams—or 2 cups + 3 tablespoons (I rounded off to 2 ¼ cups). Five hundred grams of sugar is 2 ½ cups—but I used a little less, 2 ¼ cups. 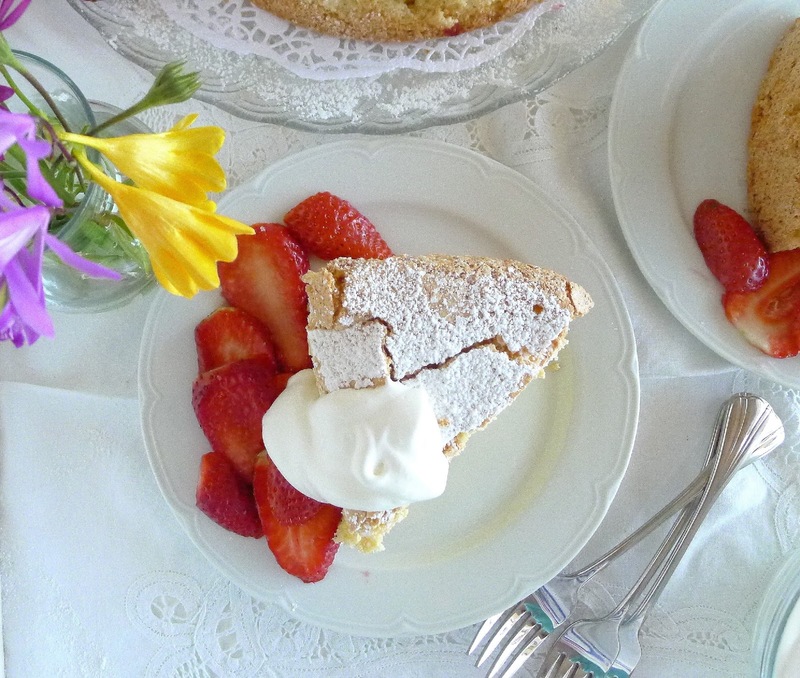 You will need a 9- or 10-inch cake pan at least 4 inches deep. (I used a spring-form mold.) Otherwise, use 2 or 3 layer cake pans or a rectangular sheet pan. Baking time will vary depending on depth of pan. Warming the eggs slightly in hot water helps them to increase their volume when beating. 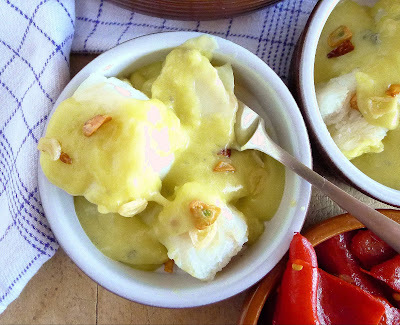 Huevos de campo (free-range eggs). 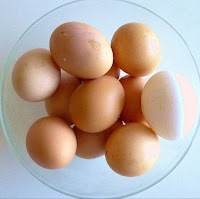 Place the eggs in a bowl and cover them with hot tap water. Allow to stand 10 minutes and drain. Preheat oven to 350º. Have ready a greased 10-inch spring-form mold (or two 9 X 14-inch pans), the bottom lined with baking parchment. 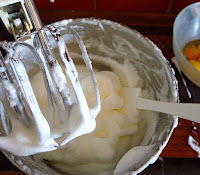 Beat the egg whites on high speed until they hold stiff peaks. Beat in the lemon juice and salt. Beat yolks and sugar until thick. Beat the egg yolks until combined. Gradually beat in the sugar and lemon zest. 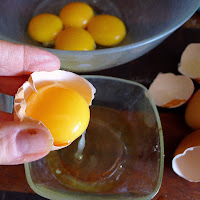 Beat the yolks until they are thick and pale in color, about 5 minutes. On low speed, beat the yolks into the whites (or, fold them in by hand). 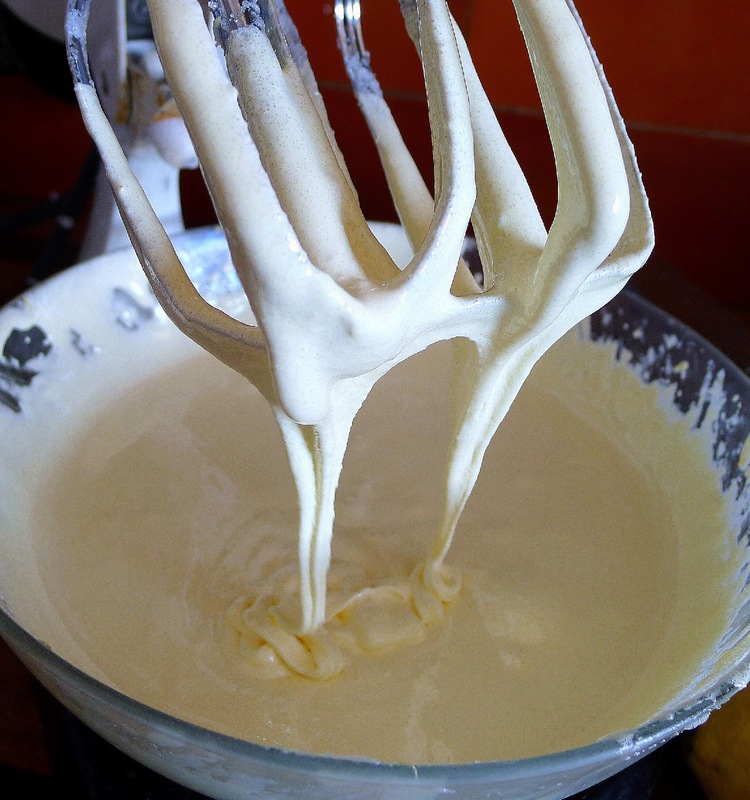 Sift ½ cup of flour over the batter and fold it in. Sift and fold in the remaining flour in half-cup additions. Combine well. Cool cake on a rack. 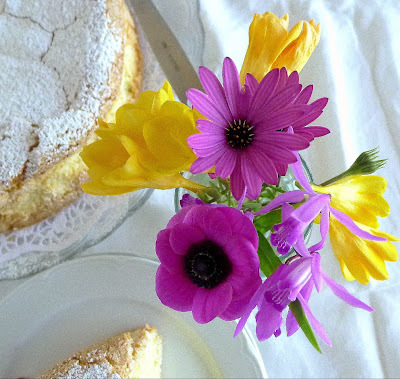 Remove cake from the spring form while still warm. Allow the cake to cool on a rack. 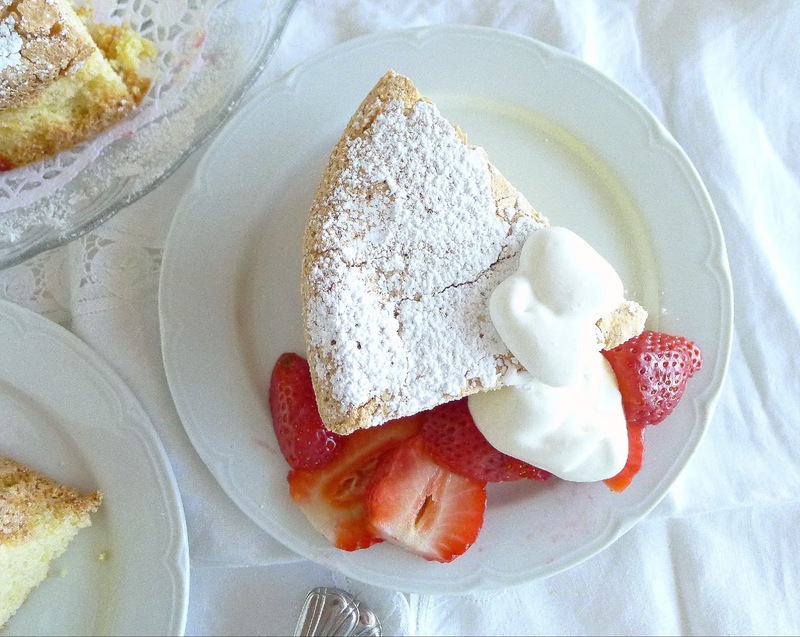 Place it on a cake platter and dust with sifted confectioners’ sugar. 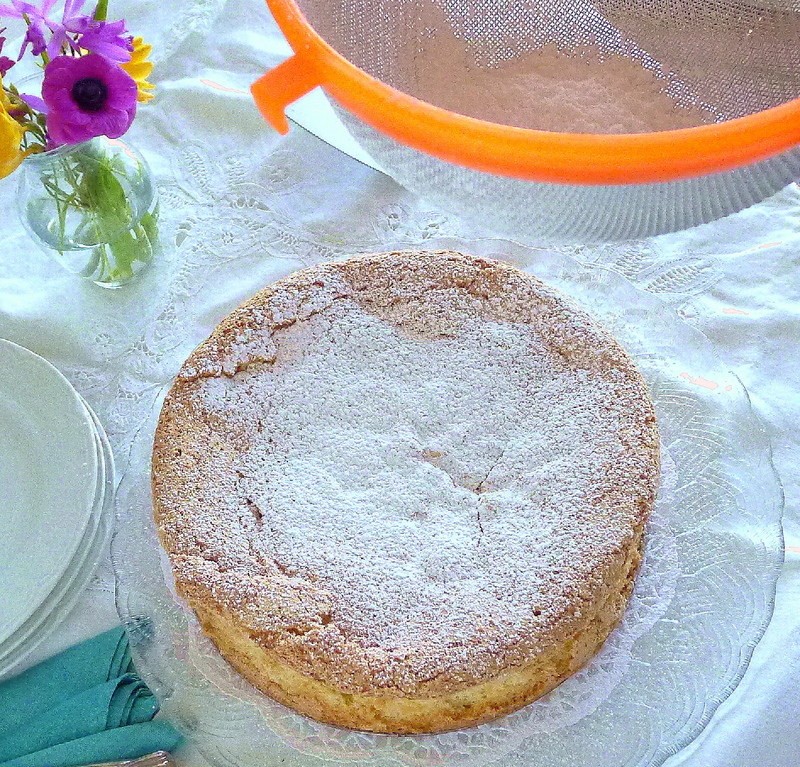 Sift confectioners' sugar over the top of the cake. In the first several years that I lived in Spain, we always went to Málaga during Semana Santa (Holy Week) to see the religious processions, with their amazing pageantry. Drums and trumpets keeping a mournful rhythm. Flowers, candles, hooded penitents. The thrilling squad of legionnaires marching behind the Christ of the Good Death. Images of the Virgin Mary with jeweled teardrops. The piercing wail of a saeta, a love song to the Virgin. 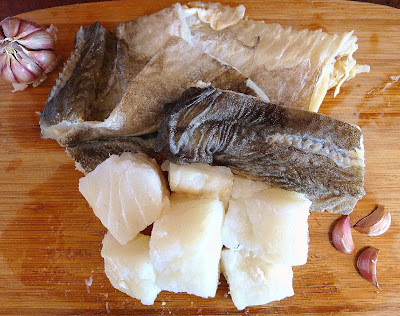 It seemed there was a bar on every corner, offering tapas special for Holy Week—salt cod, shrimp, fried fish. There was someone to run out with beers for the costaleros—burly men carrying the heavy floats bearing sacred images of Christ crucified. It was usually 2 or 3 in the morning as we watched the processions wend their way back to their home churches. By then, cold and tired, we needed a pick-me-up. 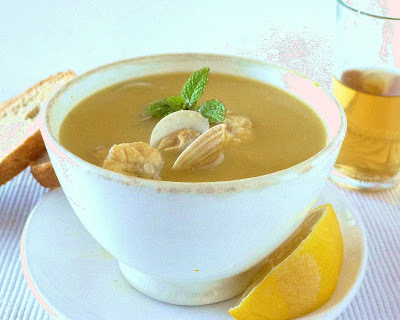 Chunks of fish and clams in a saffron broth, a fine pick-me-up soup. Traditionally, the soup was served in bowls like this one. In the old days, coffee was served in bowls too. 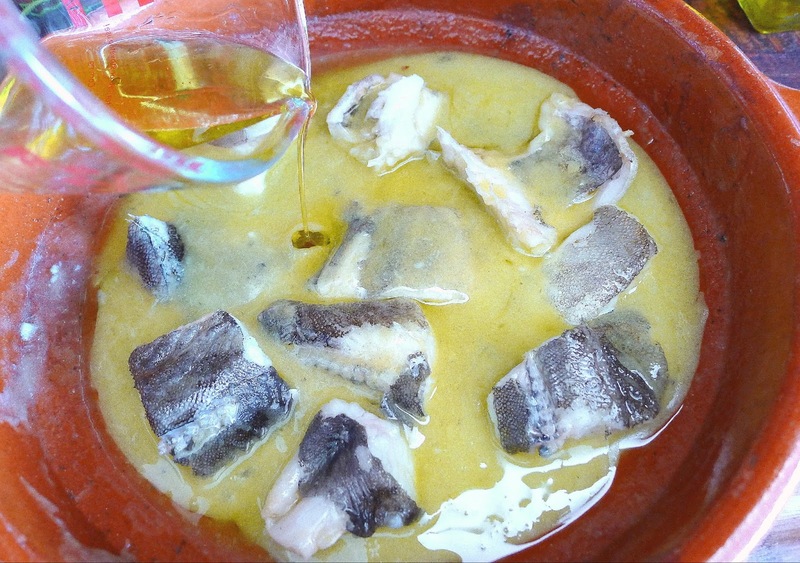 This soup, caldillo de pintarroja, a Málaga specialty, is just the ticket--warming, restorative, eye-opening. Once a fishermen’s pre-dawn wake-up brew, it became a favorite tapa in Málaga bars and is much touted as a cure-all after a night of bar-hopping. Unusually in Spanish cooking, the soup packs a real jolt of chile. Caldillo actually means “broth,” not soup. The broth has chunks of fish—pintarroja—and clams in it. Ground almonds and bread thicken it slightly. Pintarroja (Scyliorhinus canicula) is a very small member of the shark family, similar to the much larger cazón or dogfish. Like other specimens, it does not have bones, but rather a spine of cartilage, making the fish easy to eat. Plate for bones and shells. This is a real working-man’s soup, so it’s served with “bones” and clam shells. Provide side plates for the desperdicios, the remains. 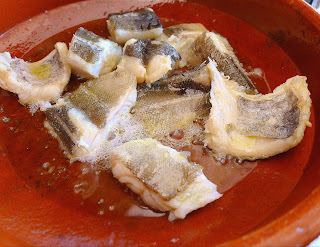 If you prefer a more “couth” version, cook the pieces of pintarroja in the stock, strain them out and, when cool enough to handle, remove the center “bone” (cartilage). Or, use bone-free chunks of fish, such as dogfish or monkfish. 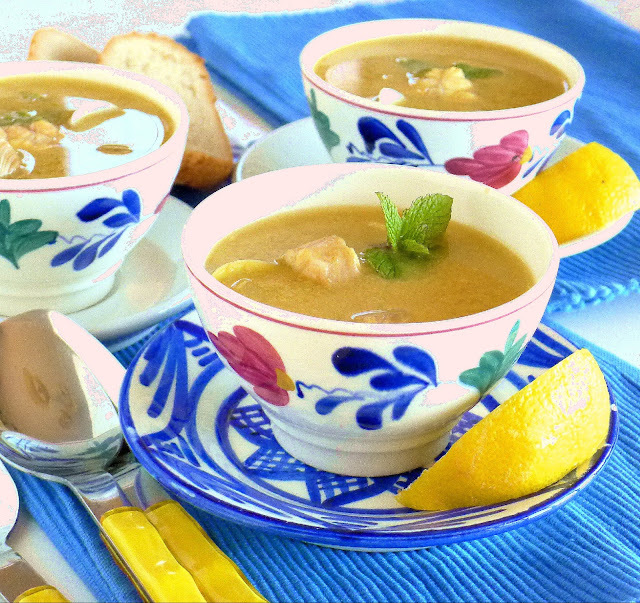 In the traditional version of this soup, not saffron, but colorante is used for the vibrant gold color. I've used saffron here. 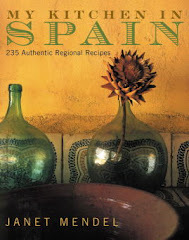 It’s many years since I have been to Málaga during Holy Week. Now, I can watch the processions on TV. 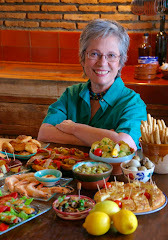 But, I do miss the wonderful tapas. How much chile? 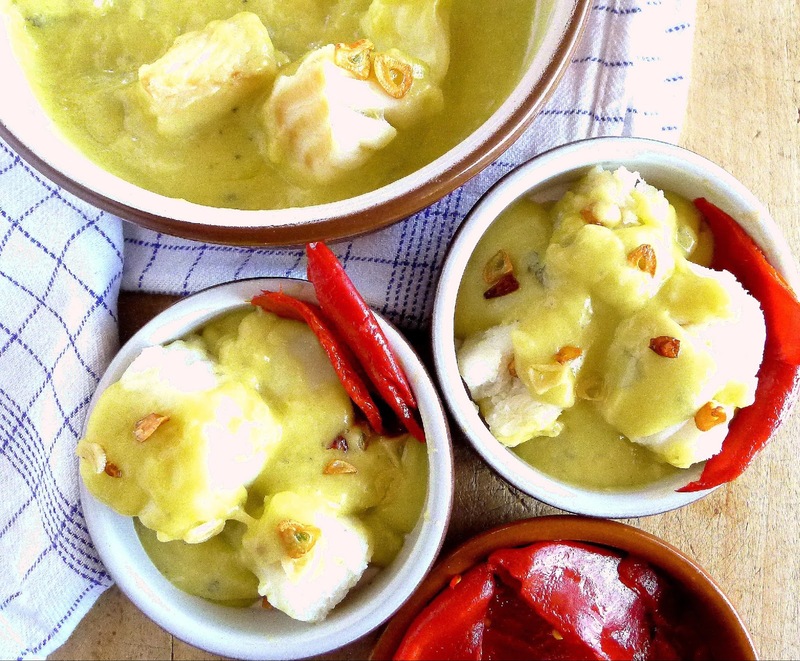 The soup should be picante—spicy-hot. But the quantity depends on what chile you’re using and your tolerance for hot foods. 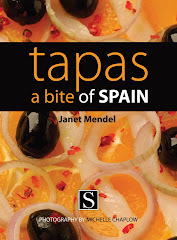 Spaniards generally have a very low tolerance! I used two small dried cayenne chiles for a very medium hit. Still, it was a good wake-up soup. I bought three pintarrojas, each weighing about 1/2 pound. I used two for this recipe. They were already cleaned and skinned. The polka-dotted skin is so rough that it used to be used as sandpaper. 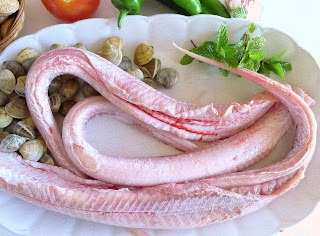 Flesh of any of the sharks must be eaten very fresh or else preserved in an adobo marinade. Cut the pintarroja crosswise into 1-inch pieces. 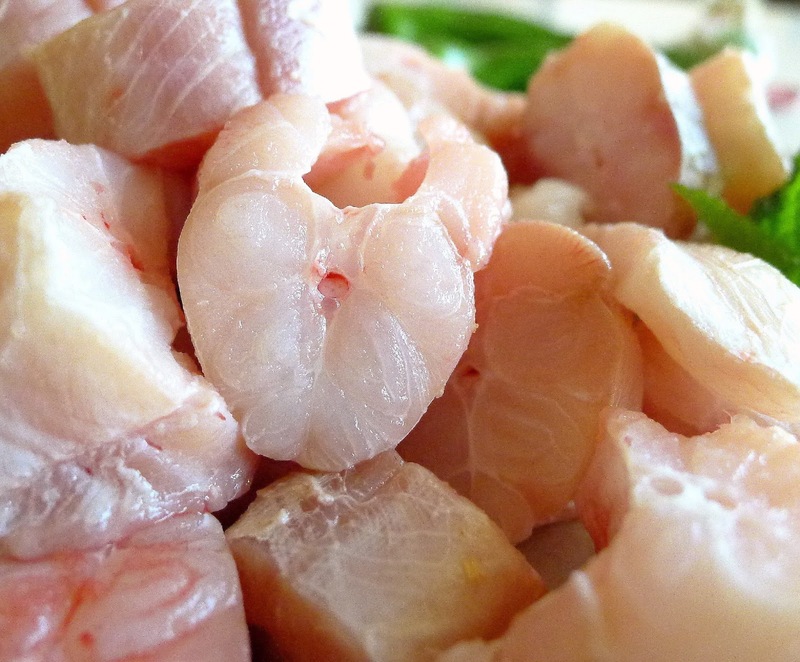 (If using dogfish or monkfish, cut into 1-inch cubes.) Wash the fish well. 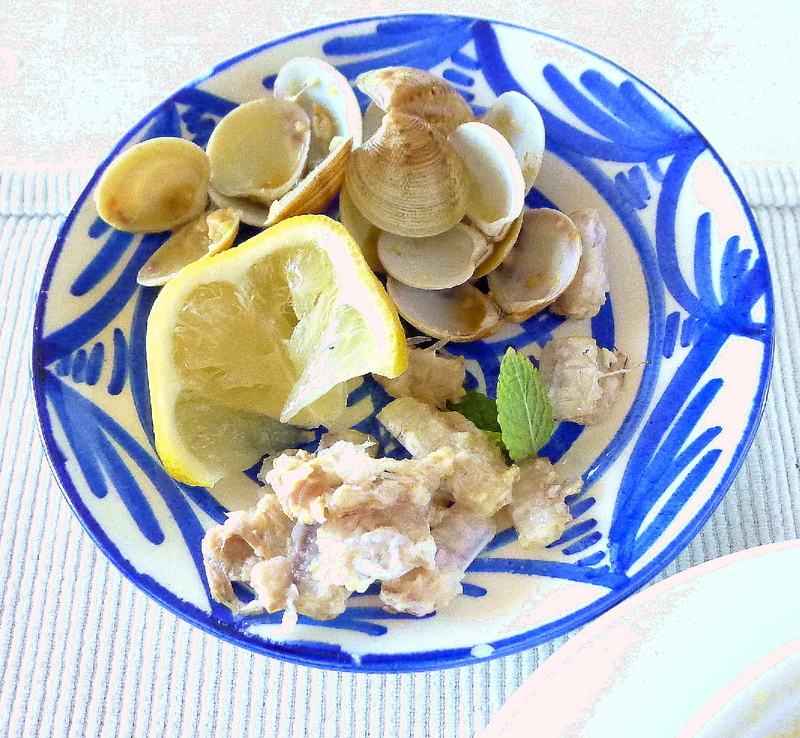 Put the clams in a bowl of lightly salted water so they disgorge any sand. 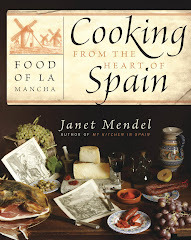 Heat 2 tablespoons of the oil in a skillet and fry the almonds, bread and garlics, stirring, until they are golden. Remove. Add remaining 1 tablespoon of oil to the skillet and sauté the onion and green pepper until softened, 3 minutes. Add the tomato and chile and continue sautéing until tomatoes release their juice. Heat the fish stock or water in a soup pot. Add ½ cup of the stock to the crushed saffron. Place the fried almonds, bread and garlics in a blender container. Add the sofrito of onions, peppers, tomatoes and chile. Add the cumin and saffron and its liquid. 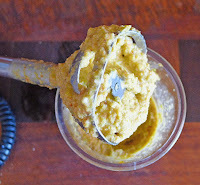 Blend to make a fairly smooth paste. Whisk the paste into the stock in the pot. Add salt to taste (about 1 teaspoon, unless the stock is already very salty). Bring to a boil, stirring, and cook 5 minutes. The bread and almonds will thicken the broth slightly. 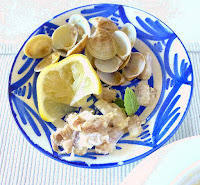 Add the pieces of fish and the clams. Cook until clam shells open, 5 to 6 minutes. 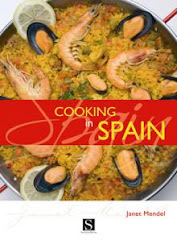 If desired, add a little Málaga seco wine. 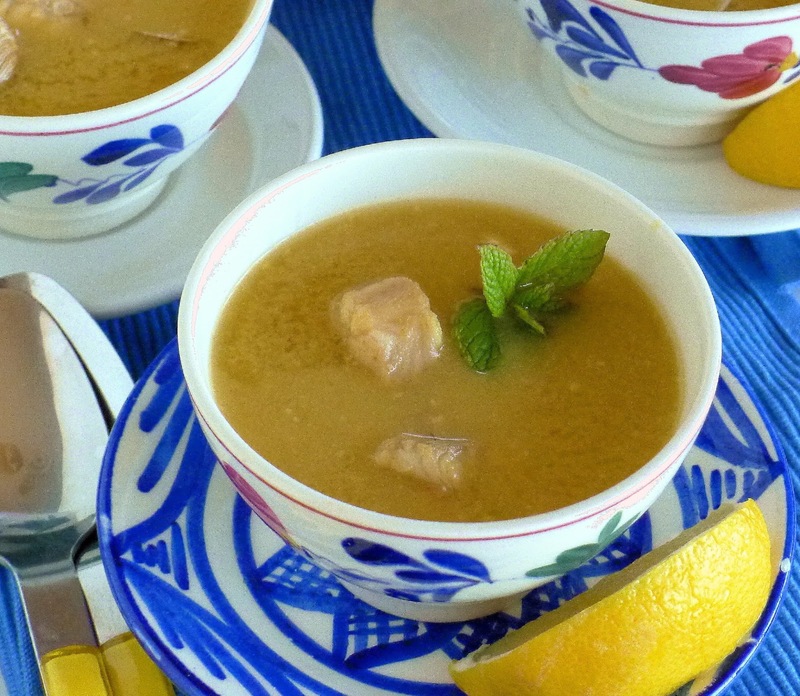 Serve the soup very hot garnished with mint. Serve accompanied by lemon wedges. 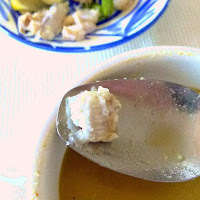 Fish chunk has center cartilage. Garnish the soup with fragrant mint and lemon wedges. 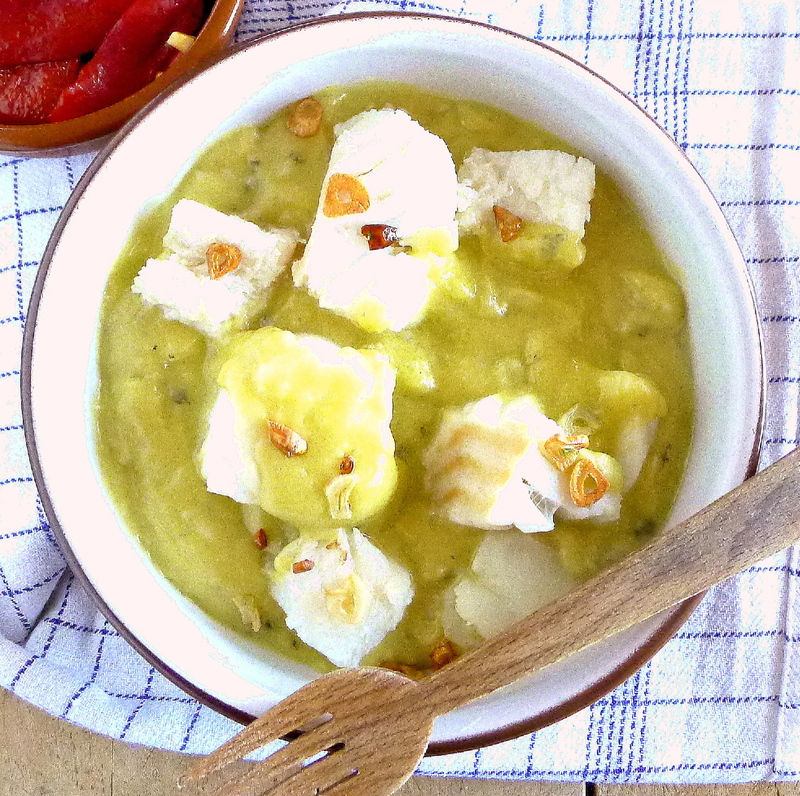 Another recipe for pintarroja is here. Watch the Spanish Foreign Legionnaires in the ceremony carrying the image of the Christ of the Good Death, Málaga Holy Week, 2015 https://www.youtube.com/watch?v=9gk1XIOSgfc . At dinner the night before my visit to the pig habitat, I had a chance to sample fresh ibérico pork, the raw material for ham. Cuts with names like “secret,” “feather” and “prize” were grilled over smoldering oak coals and served medium-rare. Marbled like prime beef, the meat was tender and juicy. But what I enjoyed most were the tender carrilladas, pork cheeks braised in a wine sauce. Braised pork cheeks in a wine sauce with prunes. Since then, I buy pork cheeks—both ibérico and regular pork—when I find them at a local supermarket and stash them in the freezer, ready for when I want an easy, slow-cooked meal. Pork cheeks are collops of muscle meat that need slow cooking to become tender. 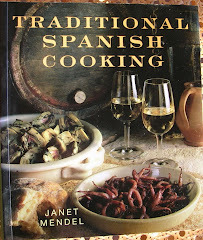 Spanish cooks suggest using the pressure cooker, but I like to braise them in a wine sauce. After about 90 minutes, they are fork-tender. 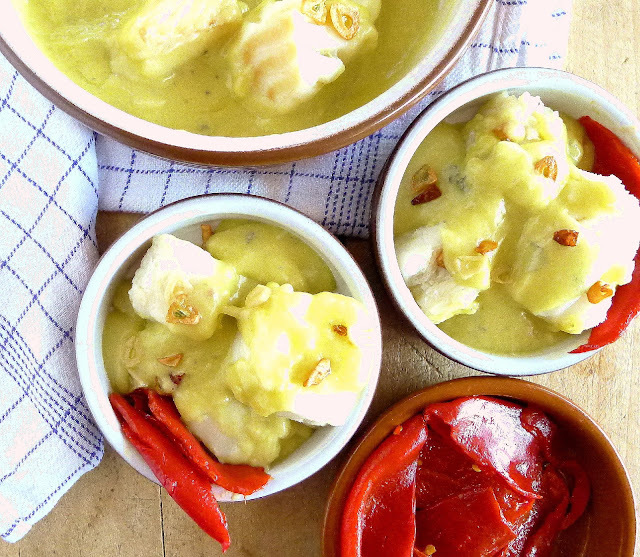 The savory sauce practically begs for mashed potatoes or chunks of bread. By the way, I’ve learned that kids really like pork cheeks, at least if you don’t get too graphic about where the meat comes from. 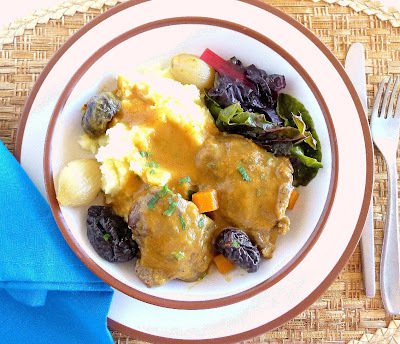 Serve mashed potatoes with the pork cheeks to soak up the delicious gravy. Chard is a good side. 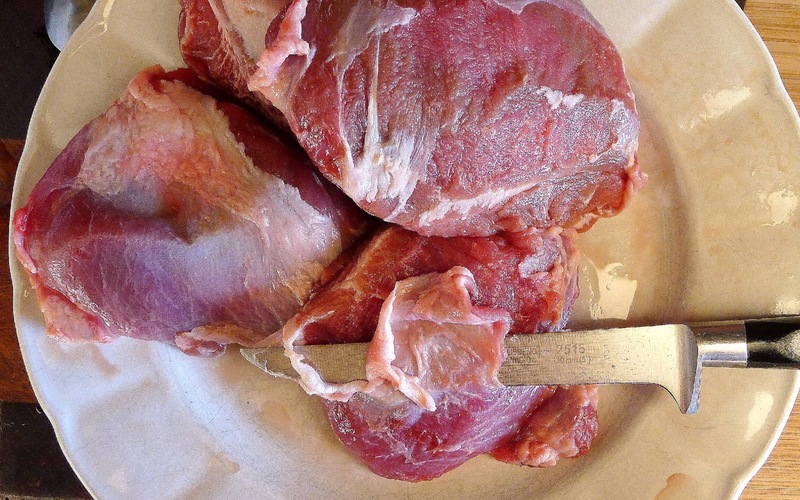 The size of pork cheeks varies considerably (4 to 6 ounces each). Allow two per person, depending on size. Very large ones can be cut in half. I cooked four (1 pound 2 ounces), to serve two persons. The meat shrinks considerably during braising. 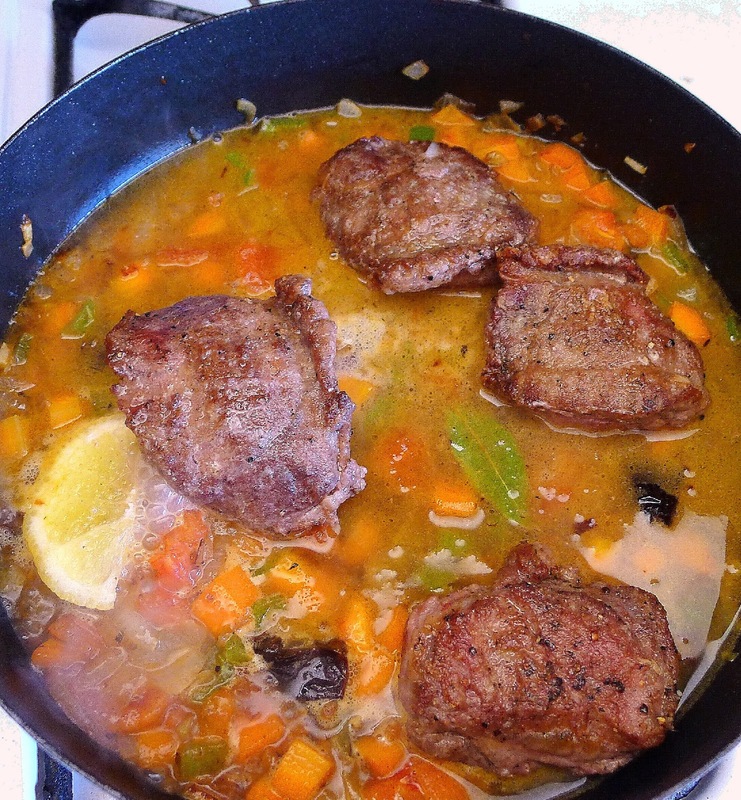 Beef or veal cheeks can be prepared in the same manner, but, being larger, they will require longer cooking. 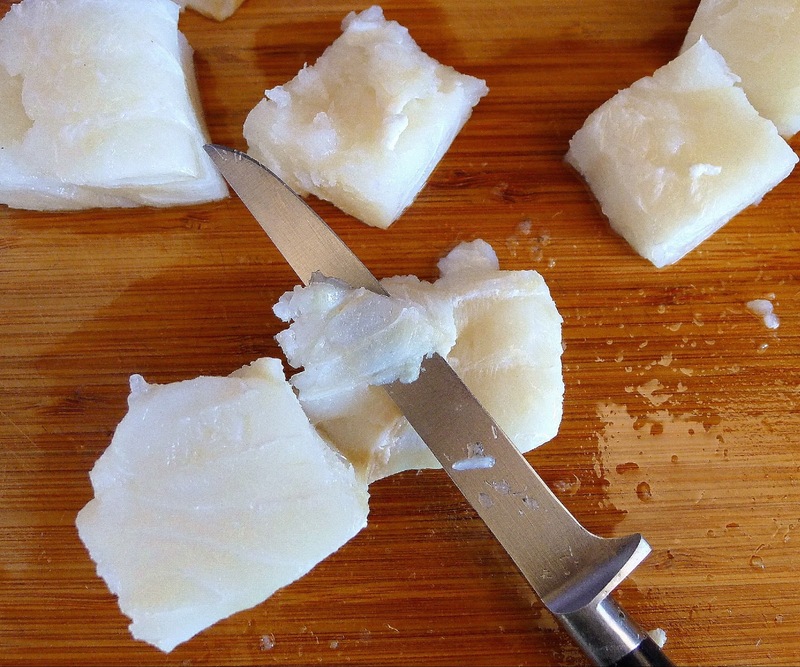 Cut away thin layer of fat. Unless the butcher has already done it, you will need to remove the membrane of fat that covers one side of the piece of meat. Use the tip of a knife to lift and cut it free. Sprinkle the pieces of meat with salt and pepper. 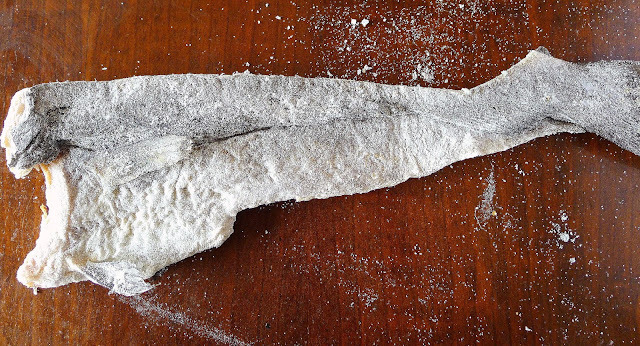 Dust them lightly with flour. Heat the oil in a pan and brown the pieces of meat on both sides. Remove them from the pan. Add the diced carrot, onion, green pepper and garlic to the pan and sauté until onion begins to brown, about 5 minutes. Add the chopped tomato and sauté until liquid is cooked off. 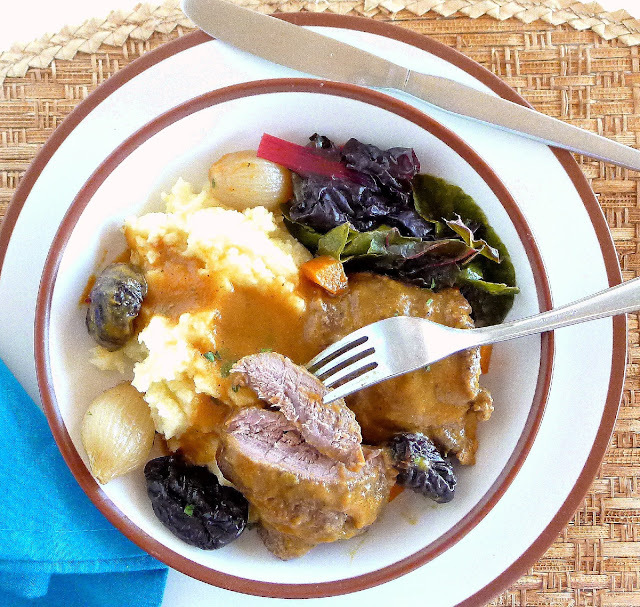 Wine, prunes and chopped carrots cook with the meat. Return the meat to the pan. Add one of the prunes, quartered, the wine, water, ginger, cloves, bay leaf and lemon. Add small onions, if using. Add about ½ teaspoon salt (unless you have used meat stock, in which case salt is probably not needed). Bring the liquid to a boil, then reduce heat to a simmer and cover the pan. Cook the pork cheeks 45 minutes. Turn them and remove the small, whole onions if you have used them. Cook the meat 40 to 45 minutes longer, or until it is fork-tender. Remove and discard the lemon and bay leaf. Remove the cheeks to a plate and keep them warm with a few bits of diced carrots for garnish. Place the remaining vegetables and liquid in a blender with the vinegar. Blend to make a smooth sauce. Return the meat, sauce, cooked onions and remaining prunes to the pan. Simmer 10 minutes. Serve sprinkled with a few diced carrots and chopped parsley. Meat is so tender you probably don't need a knife. 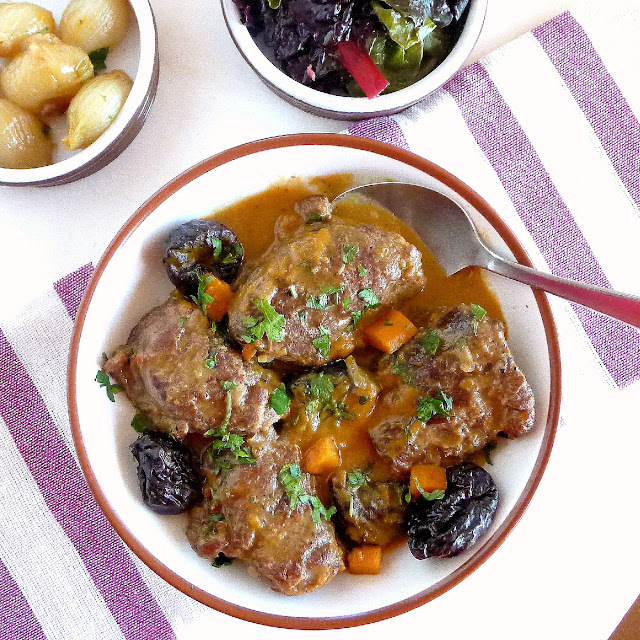 Another recipe for pork cheeks is here.